Editor's note: Abubakar Tsav, a retired former public complaints commissioner of the federation writes on Nigerian Army's operations against terrorism in the north east region of Nigeria. Tsav opines that the Army has managed to achieved and wade off the insurgency and criminality in the region due to the leadership attributes of the Chief of Army Staff, Tukur Buratai. An American literary pundit, Joseph John Campbell has archetypal veneration of heroes in all his fictional works. This literary guru cannot be less accurate and persuasive in opening the eyes of the world to his recognition of the innate worth of heroes. Nigeria’s Chief of Army Staff and Leader of the counter-insurgency operations in the country, Lieutenant General TY Buratai comes to mind, each time one reflects deeply on the concept of heroism. A terrorist is hated with a passion. He is dreaded in Nigeria, like in any part of the world. His limitless taste for bloodshed and destruction rates him higher than Lucifer. He is resented and avoided, like a killer plaque. No one wishes to be his neighbor or share the same territory with him. Not every trained fighter or soldier is willing to fight terrorism wars. Their blades and bombs neither have enemies nor friends. And for more than seven years, Boko Haram held Nigerians haughtily in captivity, brandishing swords and valour everywhere in the land. They passed as untouchables as reflected in killings, abductions, sexual harassment and forced marriages of female hostages, destruction and seizure of Nigerian territories. But President Muhammdu Buhari gave them the hardest punch, by his appointment of Lieutenant General Buratai, as COAS, a rugged soldier and living encyclopedia of the guerrilla and asymmetric war strategies of insurgents. An unsung hero no doubt, but Buratai knows how to play the war game and he is effective at it. So, he moved aggressively after terrorists, when others feared. But Buratai, the lanky, flat-bellied Army General, a core professional, super intellectual and dynamite in military strategies and tactics, sparks admiration because he radiates with splendor on the job. In spite of his high office and clout in the country, he still exudes traces of that little boy from a humble family in the obscure community of Biu, Borno State. This forlorn community is where another star boy was dashed to the country through the . He has uncommon leadership traits. While most African leaders, speak before they think, Lieutenant General Buratai belongs to the exceptional breed of leaders who first grasp their thoughts on any issue before any verbal exercise. He sticks to his words like bees on honey. These leadership qualities have always distinguished him from the lot, anywhere he is entrusted to lead. Gen. Buratai pledged to change the narrative in the operations against Boko Haram in order to fortify their final routing of insurgents out of Nigeria. And in consonance with his pledge, he led troops to relentlessly and assiduously work on this plan. Its most outstanding relic is the demystification and conquest of the dreaded terrorists haven, Sambisa Forest in Borno. He penetrated it to Camp Zero which previously served as refuge camp for insurgents, including their top commanders and foot soldiers. What the Army accomplished on Sambisa Forest can only be appreciated, when gleaned from the perspective that three or four of Gen. Buratai’s predecessors could not dare insurgents in the forest. Even the abducted Chibok schoolgirls were initially housed in a transit camp in Sambisa forest for weeks before their eventual evacuation, to an unknown destination, while leadership of the nation engaged in denials of its veracity. But even when it was confirmed, nobody was courageous enough to attack Sambisa forest. Therefore, Lieutenant General Buratai believes in Ralph Waldo Emerson’s wisdom which says, “Do not go where the path may lead, go instead where there is no path and leave a trail.” So, he adopted fresh strategies at every stage in the anti-terrorism combats, launching operations, some with localized code names which appealed to the natives and also, answered clearly to an aspect of the assignment he wants done. He prepared, empowered and supervised troops for a specific job and ensured it is executed within the stipulated time. And the quantum of these specialized operations across Nigeria where insurgencies or insurrectional problems existed is an expression of Lieutenant General Buratai’s focus, purposefulness and the overriding desire to deliver on his mandate. He has launched Operation Lafiya Dole (Peace By All Means) which is responsible for containing the Boko Haram insurgency in the Northeast; there was “Operation Delta Safe”, staged to extricate the Niger Delta from armed militants, illegal oil bunkerers, vandals, kidnappers and allied armed criminals. And southeast’s “Operation Python Dance,” guillotined the wings of armed secession agitators. 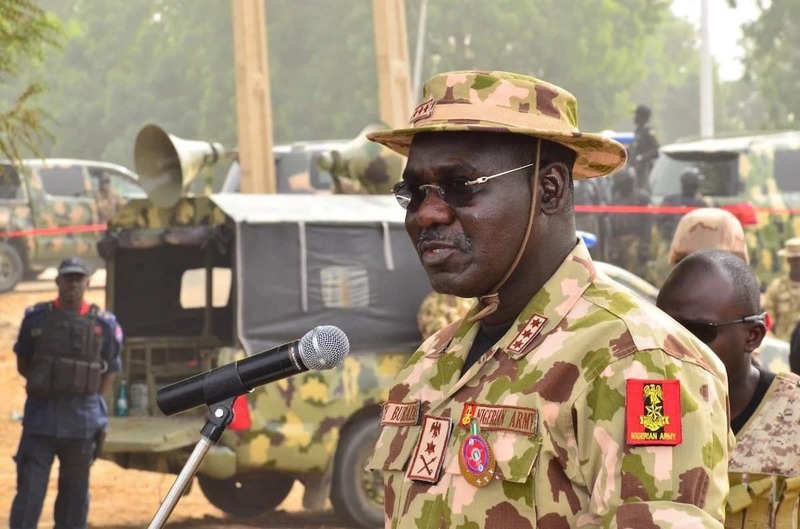 Lieutenant General Buratai dashed ethno-religious warlords and other armed militia in North Central states, “Operation Ayem Akpatuma,” and in the same Northeast, “Operation LAST HOLD” has registered its presence, ensuring the return of IDPs and facilitation of animated fishing, farming and other economic activities in the Lake Chad Basin. Ayem Akpatuma was structured to curtail the herders/farmers skirmishes; flush out armed militia and restore peace to troubled communities. The list is endless and each of the specialized operation has fulfilled its mission, without any complaint of human rights violations of members of host communities by army personnel. It explains why when Nigerians became exasperated by the resurgence of Boko Haram attacks by remnants of the fleeing sects, spurred by partisanship, Lieutenant General Buratai remained unperturbed and confident that his troops will repress them. Those who think Boko Haram insurgents are happy losing the Sambisa forest to the Nigerian Army are living dreamland. The insurgents plot day and night to reclaim the forest; but there is no hope of success. Just within the week screeching to an end, Nigerian troops of the Operation Lafiya Dole twice crushed Boko Haram fighters at Mallam Fatori, in Borno State. Many insurgents were killed in the exchange of gunfire and weapons recovered from them, including 10 gun trucks and ammunition.